Thank you all for your overwhelming outpouring of support for the Barbudan people, the island, Coco Point Lodge, its amazing team, and the Kelly family throughout the enormously difficult time it has been and continues to be since Hurricane Irma devastated Barbuda on September 6th. The level of care expressed has been so greatly appreciated, and the financial donations to The Coco Point Fund to help Barbudans simply astounding. We truly can’t thank you enough. The priority is the lives of the Barbudans who we all care so deeply about and yearn to see fully recover as absolutely best they can from the horrific negative impacts that Irma had on all of them. We are so very grateful to say that this is what The Coco Point Fund is entirely and wholeheartedly dedicated to doing: trying to help the strong, resilient, hardworking people of Barbuda help themselves in putting their lives, their homes, and their community in Codrington back together. We have been pleased to assist The Fund in these efforts. For those of you who read The Coco Point Fund Board’s update email on Oct 24th, you know the damage to Coco Point Lodge is extensive and the impact it has had on our entire team and our family is devastating. We realize that after 57 consecutive years of operation, opening for the 2017-2018 season is not going to be possible. This is obviously extremely sad news for all our Coco Point family of guests who have so enjoyed their vacations with us. We are very aware that for many guests, spending time with each other and the Coco Point staff has become an integral and important part of their annual travel and/or family traditions. We have been thinking of you all and we will continue to through the upcoming holiday season and into the new year. As for our plans and progress for the future, all of this is a very slow process and one which we are and have to take one step forward at a time, one day at a time. The Barbudans are only just starting to return to Codrington from Antigua for any length of time more than just a night or two, and there have been numerous issues with their transportation by ferry between Antigua and Barbuda, not enough capacity and proper organizing, not to mention that water and electricity in Codrington have still not yet been fully restored. There are so many questions up in the air and so much uncertainty that we wish we had more answers and solutions that we ourselves could give, but we and Coco Point are at the mercy of this ever-changing situation that continues to evolve and morph every single day. We will do the best we can sending out further update emails when we know more. But in closing for now, we thank you all again so very much for your enormous expressions of care and concern and your very generous support to help the absolutely wonderful and steadfast people of Barbuda recover. We are truly thankful for the friendship and love that you have shown for our family, not just the Kellys, but the Coco Point family, all of us, from Ray and Denise, to Aldis, Charles, Myra, Alcon, Ruth, Anne-Marie, Mulvane, Brittney, William, Devon, Bentham, Latoya, Glenford, Dalma, Primrose, Irwin, Eva May, Hickroy, Phil, Whitfield, Nickie, Terrance, Claudette, Avenella, Josea, Joanne, Triphina, Dorciah, Kenrick, Palo, Mark, Henry, Carlon, Ricklee, Lestroy, Shane, Dion, Nelson, Bernette, Kaiwah, and so very many more that they cannot all be named here. We are all, ALL, the Coco Point Family, and we thank you for being members of that family. Last Saturday Barbuda was gratefully spared from a direct hit by Hurricane Jose. All Barbudans are safely in Antigua. How long exactly they all will remain there before they are allowed to return to Barbuda has not yet been determined as it is currently unsafe for them in Barbuda. But, the most important thing is our Barbudan team members, their families, friends, and neighbors are safe, and they are receiving tremendous care, help, and support from their wonderful countrywomen and men of Antigua who are hosting them. My family and I thank you for the hundreds upon hundreds of messages, emails, calls, and texts that we have received since Hurricane Irma hit Barbuda this past week. So very many of you have asked what you can do to help Barbudans. What you can do is to please give tax-deductible donations to The Coco Point Fund. The Coco Point Fund is a 501 (c) (3) exempt organization founded and run by guests of Coco Point Lodge. The Board of The Fund sent an appeal letter for Irma Relief via email to many of you on Friday. However, to ensure that all of our guests and friends for whom we have email addresses receive this letter, we are also sending it. The letter is included below. Please share and forward this letter to all of your family and friends who might consider giving. We have been providing updates on our Facebook and Twitter pages, and encourage you to like and/or follow us to make sure you receive these messages. On behalf of the Kelly Family, the General Managers of Coco Point Ray and Denise Doherty, all of the members of the Coco Point team, their families, friends, and neighbors, thank you so much for giving what you can at this time of Barbuda’s extraordinary need. Today the Barbudans who were willing to leave Barbuda were evacuated to Antigua. Hundreds of them were flown from Kelly Field at Coco Point to Antigua. They had to leave Barbuda because tomorrow another hurricane will hit Barbuda, Hurricane Jose. Please continue to keep all of the Barbudan people in your thoughts and prayers for their safety and security through a second hurricane this week. Thank you for so very many of you emailing and calling to ask what you can do for our Coco Point team members in Barbuda, their families, friends, and neighbors. 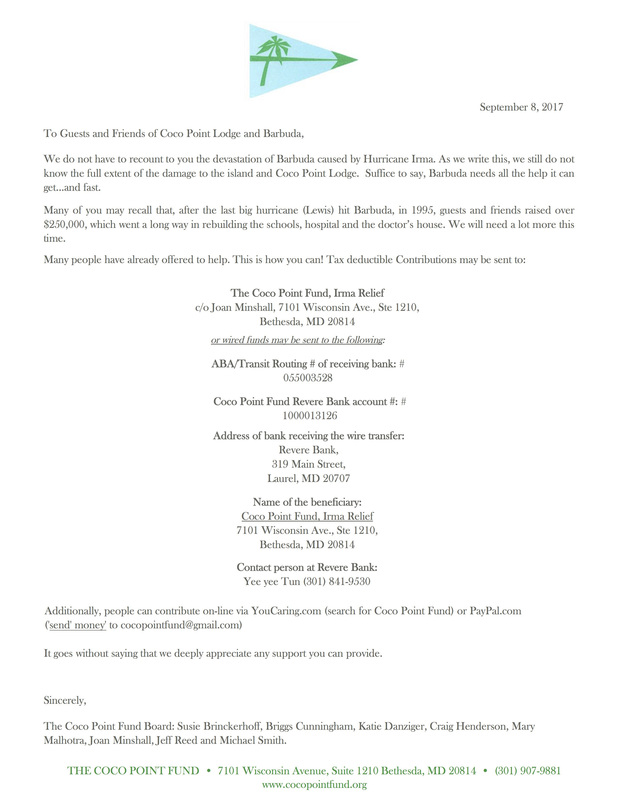 Shortly, The Coco Point Fund will be sending a letter via email about how and where donations can be directed to best and fastest get those funds to all of the Barbudan people who are so very much in need. We will all be so grateful for all of the help and support you can give. Thank you for all of your messages, emails, calls, and texts — we are receiving all of them and grateful for all of your love and support of our team, the people of Barbuda, and Coco Point. Communication with Barbuda is still limited, but we are seeing reports that despite the severity of the storm there appears to have only been one fatality. We are monitoring the situation and working to get more information and will keep you updated. We are already preparing for the 2013-2014 season (our 53rd!) at Coco Point and are excited to announce new off-peak reduced rates. We have decided to go back to a two-tier rate structure with lower rates for large portions of the season. For the periods of December 15, 2013 to January 5, 2014, and February 15, 2014 to April 1, 2014, rates will remain unchanged from this past season. For the rest of next season (December 8 to 15, 2013; January 5 to February 15, 2014; and April 1 to May 1, 2014), we are reintroducing our reduced rates. We hope to encourage new guests to visit us with this special opportunity to experience our unique all-inclusive experience at an unprecedented value. And even if you are one of our many cherished long-time guests, you can still take advantage of this offer. Please review our all-new 2013-2014 Season Rates Sheet, and please take a moment to share this news with friends and family who may be interested. Thank you, and we look forward to welcoming you here at Coco Point next season! We hope that those of you who have stayed with us in the past will see that the new website is more representative of our little spot of Paradise. Please poke around, enjoy the pictures, and let us know what you think! While you’re here, please consider signing up for our online newsletter, where we will post occasional updates from Coco Point. Simply sign up on the right hand side of this page. We’ll also post occasional updates on Twitter and Facebook, so if you use either site, you can follow or like us.